So far, Spirited Away is the only Oscar-winning Japanese animated film, surpassing Ice Age, Lilo & Stitch, Spirit: Stallion of the Cimarron and Treasure Planet. It is also the highest grossing movie in Japanese cinema history, earning $274 million worldwide. This article does not tell you about the plot, which will be my most impressive thing. The metaphorical details of greed, one of the elements of human nature, are repeated many times in the film. 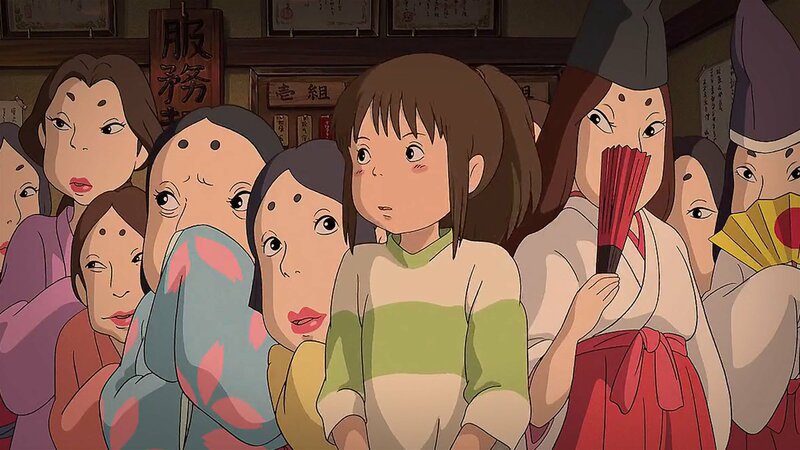 Spirited away begins with the story of the Chihiro family – a shy little girl – lost in a strange land in the journey home. Chihiro’s parents are curious to discover, and are captivated by the taste of the food in the stores. Inability to resist, both of them were turned into pigs and trapped in this mysterious world. From there, Chihiro began a challenging journey in a completely foreign place to rescue her parents and return to the real world. Another noteworthy thing is that the greedy staff in the bathroom where Chihiro worked, when they received the money from the No Face, were eaten by him. These are the scary punishments of the magical world, but in the real world? We may not turn into pigs, nor eat anyone’s meat, but ever greed makes you lose your honor and dignity. If you’ve ever seen a movie, then when I talk about it, you’ll immediately associate it with the No Face character. He is a fearsome monster that appears in Yubaba’s Bath shower, as mentioned above, he is willing to devour those who greedily receive his gold. It does not have a specific shape, nor has a face and even interest in anyone in his own world. It is a very special character – he makes us think of ourselves: who has never experienced the feeling of his existence has no meaning in the world ? With the main character Chihiro, this is a journey to find out the name itself. In the land of the soul, the magician and master Yubaba gave her a new name: Sen. As long in this mysterious world, Sen gradually forget his own real name and perhaps she had forgotten forever without the help from Haku. Without a real name, Sen can not return to normal world. When you forget who you are, you are not really living your life but only live by the instructions of others. I believe the Ghibli fans agree that one of the biggest things that made Spirited Away’s appeal was love story between Chihiro and the young man Haku – a river god who forgot his identity. It is probably due to the fate that Haku had known about Chihiro long before, in one of her rescue drowning. During the hardships of the magical world, it is Haku who helps and protects her while in trouble. Strangely, Haku has forgotten his name in this world, still remembers Chihiro’s real name even though she only remembers herself as Sen. Is that true love? Maybe I’m a bit romantic like many other Ghibli fans, but I can not help but be touched by this. The beauty of love is that it does not need an ostentatious expression. You do not see any details between the two main characters affirming their love for each other, but you can not help but feel it. It is strange that Chihiro was only a little girl. But it does not matter. The reason that I feel in tune with Chihiro is because I can feel the maturity of her journey: the journey to rescue her parents, the journey to find the name for herself, the journey back to the real world.As a child, Chihiro has struggled to grow up in a dangerous and harsh environment, not only recognizing his true parents, but also saving Haku from magical spells. Must be placed in the specific circumstances, people find their own strength and extraordinary powers. The last scene in the film makes a lot of sense. To go back to the real world, Chihiro must walk on the grass and not be allowed to come back. To me it is a metaphor for sometimes you have to really know how to forget the past to start a new life. But who would not expect Chihiro to meet Haku again?